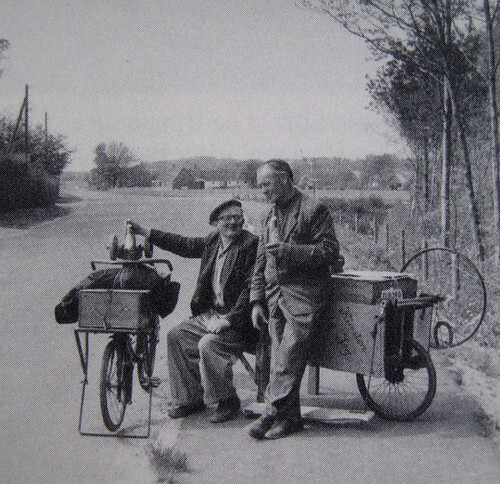 A historical photo of two classic figures in bicycle history. Two knife sharpeners. They rode about both the countryside and the city, offering their blade sharpening services to anyone who would pay the price. The usual setup was like the bicycle on the left. The back bicycle wheel was rigged with an external cog onto which a strap was attached so that they could sit stationary and pedal whilst sharpening knives, scissors and all manner of blades. The chap on the left as a similar but seemingly more complex system. The last time I saw one was in the city centre about ten years ago. Parked in a courtyard behind a trendy café, he was handed knives from the chefs through the window and he would mount his bicycle and sharpen them to perfection. Here's a more recent version from the streets of Africa. Wonderful. Thanks for the link in the comments.